We stayed in one of their cottages up the hill. It had a great view of the town and river. Breakfast was perfect. If you've been to Hermann you know the train can be a bit loud at night, but we didn't hear the train at all. Would stay here again. 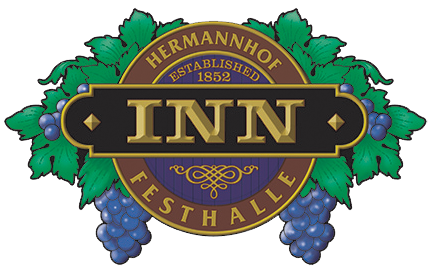 We had a wonderful time at The Inn at Hermannhoff! The have everything you need and more for your getaway! I loved the personal touches, luxurious jacuzzi and old German antiques! Fabulous! We stayed at the cottages and enjoyed it very much. The rooms were well maintained and very clean. They were very nicely decorated and had a great view of town from the hill. We were greeted with a wine and cheese tray, and the wine provided (White Lady) has become a favorite of ours. Highly recommended. This is our new favorite place to get away. This was our 2nd visit and both times everything has been absolutely perfect. Luxurious room and good service. We are planning to come back again. Fabulous setting for a wedding. Lots to do in the area, especially if you like wineries! We have stayed at both the luxury suites and the cottages up in the hill and got married in the library cellar. The staff is wonderful. Could not recommend staying there enough. Love this place. Awesome scenery and just a great place to be. They serve a buffet for the bed and breakfast. It always contains meats from their sister locations. I would highly recommend that. loved the heated floors in the bathroom and the steam showers. The whole experience was great! Great staff and service. Fun great room very romantic . My sister and I did a mini vacation to Hermann and stayed in the Wagner room of Berger Gras house. Very nice! Would come here again. We stayed in yhe Paradise room. great time, lot's of history in Hermann! Stayed at the Inn. It was wonderful and beautiful. The service was top notch. Perfect room for our mini vacation. Awesome place very quiet and majestic, reasonable prices, Very friendly staff. We got engaged here last October. One of our favorite places to come back to. What a beautiful room. The Inn added the final touch to a relaxing weekend. We stayed here for one night for our anniversary in the Norton room and it was lovely! The room is beautiful. We will definitely stay here again! This is my favorite place to go and have never been disappointed in any of our many stays. It’s the best of the best. Well worth the drive. Take the train! Excellent location for a romantic getaway or anniversary celebration! The Inn was wonderful, the staff were kind and personable, and the bathroom was exquisite! I didn't want to leave that giant bathtub. We had a wonderful stay. So much to see in the little town and you don't have to drive far to see wildlife. Great place to escape. Beautiful and VERY friendly people. You cannot beat the location. Right in downtown Hermann and walking distance from Hermanoff winery and Tin Mill brewery. Definitely recommended. Loved this place. Stay on the hilltop if you have a chance- phenomenal views, large rooms and a steam shower! Lovely event. Food was excellent. You'll be tanked if you ain't careful. I, for one, was not careful. Wonderful place to stay, Great room. Staff very helpful Very nice view from balcony of the city. Great breakfast the next morning. Great rooms, excellent location. Friendly but unobtrusive staff! Will definitely visit again. Amazing place. It's like a vacation you usually have to travel very far to get, right there less than an hour from St. Louis. The town is great, the restaurants are amazing, and the hotel is likely the best hotel we've ever stayed at. We will absolutely be coming back. Phenomenal breakfasts, hosts and hostesses, rooms, and views!!! Get the Champagne Room! We highly recommend Hermann. Inn at Hermannhof has been amazing. The views are spectacular, our breakfast this morning was Heavenly and the hosts go above and beyond to ensure your stay is delightful. We stayed in the Champagne room at Hermann Haus Cottage. Clean, cozy and romantic. My friend & I stayed in the Angel Room in Hoehn House on the hill for our Girls weekend in Hermann.